This space, the historic building of the Municipality of Brescia, is the City of Brescia’s refugee front desk, and now home to one of the welcome and shelter projects managed by the Local Democracy Agency (LDA) Zavidovici. It is located near Brescia train station, under an overpass, but apart from this physical centrality it is quite marginal and difficult to access. Being traditionally seen as the first “port of entry” in the city for refugees and migrants, it has been under fierce attack by anti-immigration individuals and small groups – who in protest have thrown eggs and food against the premises, for example. The structure is large but only partially used. It is poorly connected with the surroundings, although it remains very visible in terms of its “social role” (perhaps a territorial stigma?) due to the fact that migrants and refugees often gather outside. Students were asked to propose strategies that could improve the visibility and usability of the space and, due to its social significance, how to better connect it with the vicinity and stimulate integration within a diverse community. The group’s strategy addressed the visibility and perception of the area by means of artistic interventions; the first, most simple, and extremely poetic intervention is to mount a large, white flag outside of the office to provide a clear visual signal of where the office is. The white flag will stand for the Embassy of All People, echoing the name and vision of LDA. The second intervention sees the participation of local artists and art students in painting the wall of the uninviting space around the office. This could transform it into a more welcoming place that can attract people to the area, offering them the opportunity to learn about the activities promoted by LDA for refugees and migrants. Giulia Carabelli is the Graduate Teaching Assistant for the MSc BUDD programme. She joined the current MSc students on the BUDDcamp in February. You can read here provious posts from the BUDDcamp on this blog: Urban Spcae 1 – Flero; Urban Space 2 – Caffaro; Urban Space 3 – UISP Headquarters. The BUDDCamp is a 3-day design workshop, part of the MSc Building and Urban Design for Development’s Urban Intervention Studio where students bring together theory and practice by working on the proposal of innovative design strategies for specific urban issues. For the fifth time, the BUDDCamp took place in Brescia (Italy) in collaboration with the Local Democracy Agency (LDA) Zavidovici, an organization working with refugees and asylum seekers in the city. UISP (Unione Italiana Sport per Tutti) is an association that promotes the right for all citizens to practice sport as a means to a healthier and better life. The headquarters of the association is not far from the city centre, yet it struggles to become visible in the existing urban dynamics. The MSc BUDD students who were working in this area were asked to formulate a strategy that could make this place more open and attractive to the population at large. 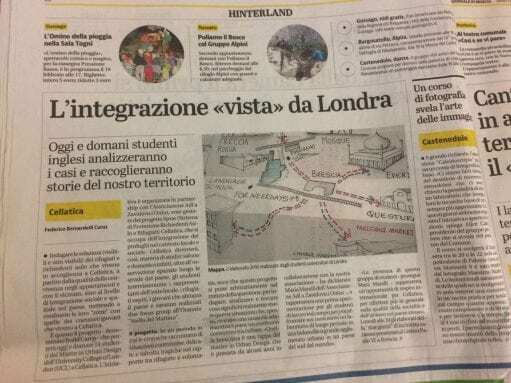 They were also asked to think about how refugees could become more active in the centre thus exploring the possibility for this place to promote integration among all the citizens of Brescia. This catalytic event, the sagra, can connect people, trigger curiosity and participation while sharing different identities and cultures by means of ‘sensory routes’ (smells and sounds). The proposal is particularly attentive to design a strategy that could involve the refugees in the planning and delivery of the activities. Giulia Carabelli is the Graduate Teaching Assistant for the MSc BUDD programme. She joined the current MSc students on the BUDDcamp in February. The final post reflecting on the BUDDcamp 2015 is now also online. Caffaro in Brescia is synonymous with pollution. The Caffaro plant has been active since the beginning of the 20th century, producing chemical elements including PCB, which has contaminated vast tracts of land causing serious health problems such as a dramatic increase in cancer rates among the residents. At the end of 2015, the plant will be definitively closed and with its closure the current occupants will stop performing certain procedures that prevent the pollution to reach the groundwater. Certainly, the closure of the plant and the future of the contaminated area will become yet again a highly debated topic in the local media. The group was asked to explore the possibility of redeveloping the site from a social point of view. The students felt the need to explore how visible the issue of Caffaro is by investigating how much is known about the plant in its neighbourhood, where almost only migrants have settled. The group writes: “We engaged with the spatial experience of the site, noticing closed green parks, high-walled factory boundaries, unclear pollution warning signs as well as several community activity centres. We got a strong impression of fragmentation and a lack of a singular or coherent identity, spatially or socially. The large presence of migrants from multiple backgrounds, led us to wonder about their perception of Caffaro. We believe engagement with local communities is essential to create common ground between actors involved. The key point of the interventions is to co-create knowledge of the factory to increase the sense of community by engaging local people in the development agenda. Having recognised that the existing multiple narratives – amongst which alarmism and denial, indifference and resilience – should be equally represented, a second proposal envisions the creation of ‘community wall paintings’; an activity in which existing residents are asked to decorate the brick walls that enclose Caffaro’s premises. “Not only will this make the factory (and its story) visible to everyone who visits the area, but it will also bring different local groups and people together in collective activities”. Giulia Carabelli is the Graduate Teaching Assistant for the MSc BUDD programme. She joined the current MSc students on the BUDDcamp in February. Look out for reflections from the other 2 case studies on the blog tomorrow and Friday. MSc Building and Urban Design for Development students have just returned from the annual BUDDCamp. Over the next four days we will be presenting a series of blogs that discuss what the students have been doing while away, alongside individual and collective reflections about their experiences and observations. The BUDDCamp is a 3-day design workshop, part of the Urban Intervention Studio where students bring together theory and practice by working on the proposal of innovative design strategies for specific urban issues. For the fifth time, the BUDDCamp took place in Brescia (Italy) in collaboration with the Local Democracy Agency (LDA) Zavidovici, an organization working with refugees and asylum seekers in the city. LDA proposed four different urban spaces to explore. Students worked in groups and had to develop small, low cost, ‘doable’ design strategies, paying special attention to the narrative, the understanding, the needs, and the aspirations of the refugees working with LDA and of the citizens living in the area where they intervened. Brescia is an extremely interesting urban laboratory. It is a small town with a population of less than 200,000 inhabitants where the effects of sudden economic transformations due to global and national crises have been accompanied by shifts in the makeup of the population. In fact, an increasing number of immigrants have settled in the city, often creating various clashes and tensions. BUDD students were presented with a representative selection of these challenges in order to provide strategies and projects aimed to foster equality and social justice. Surveys, interviews, focus groups, mapping and transect walks are few of the participatory activities that were undertaken to collectively understand and engage with the spatial and social experience of the sites. The main outputs of this intensive action-research workshop were a range of design strategies aiming to maximise the potential of these places as catalysts of new social dynamics and development towards urban justice. Students had the opportunity to present their urban strategies to our hosts and to local practitioners and civil society groups thus creating a vibrant platform for sharing their visions and ideas. The group working on this case was confronted with the specificity of the periferia diffusa (sprawled periphery) and asked to work in the small municipality of Flero, just outside Brescia. Participants had to provide a vision for the decaying and unused “Carabinieri” station; an impressive concrete skeleton of a military station that remains unfinished and derelict. There were two main challenges: the large scale of the abandoned structure and the fact that the building is partially immersed in a swamp, which has a negative effect on the wellbeing of the inhabitants (such as the invasion of rats and mosquitos). Is it possible to look at these problems as opportunities? “So” – adds Jiaqi – “we started this program by initiating a dialogue with the local community to actively engage people in the process and to produce a portfolio of ideas”. “As a result” – add Miro – “we came up with the concept of mixed-use. We developed the idea of creating a strategy that was demand-driven rather than supply-driven, which means that we encourage all kinds of private sectors, small businesses, and flexible activities to happen here in small units of the building”. The group developed a set of principles for the regeneration of the area, the use of the building and its social activation. These include: a programmatic diversification of functions and investments; an incremental occupation/appropriation of the available space and the self-sustainment of the reclamation/remediation. 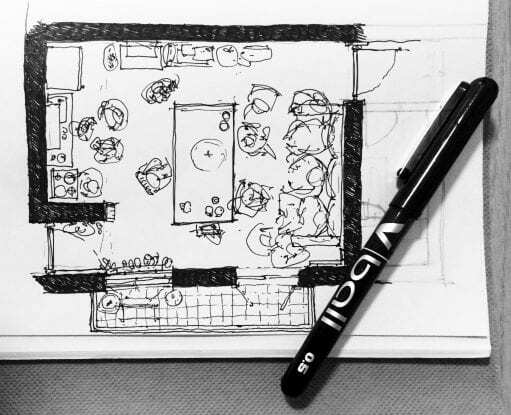 Although simple, the combination of these three principles constitutes a viable and realistic proposal to mediate between the scale of the building and the lack of resources. Giulia Carabelli is the Graduate Teaching Assistant for the MSc BUDD programme. She joined the current MSc students on the BUDDcamp in February. Look out for reflections from the other 3 case studies on the blog later this week.